Neonatal near miss review: Tracking its conceptual evolution and way forward. 1Scientist ‘B’, Department of Clinical Research, National Institute for Research in Reproductive Health (ICMR), Mumbai, Maharashtra, India. 2Scientist ‘F’, Head, Department of Operational and Clinical Research National Institute for Research in Reproductive Health (ICMR), Mumbai, India. Jehangir Merwanji Street, Parel, Mumbai, 400012, Maharashtra, India. Background: Near miss concept is a potentially useful approach to assess quality of newborn care. Analogous to MNM (Maternal near miss) approach which is already established, NNM (Neonatal Near Miss) is an evolving concept and so far, there are no standard criteria or definition for NNM. However, it may be referred to newborns that nearly died between 0-28 days but survived by chance or because of good quality of care. Objective: To conceptualize NNM event based on the experience on MNM; to review the NNM studies conducted so far and to understand the similarities, differences and gaps in these studies which will provide suggestions for conduction of future studies. Methods: We searched the Cochrane library, Google, PubMed, MEDLINE and EMBASE databases, and reference lists of published studies from 1998 till date. Results: The NNM rate in different studies done so far varies from 21-72%, mainly because of discrepancy in the criteria used. Most of the work is retrospective and some studies have evaluated neonatal near miss cases only in specific conditions like obstetric complications and specific settings like health facilities at lower level. Conclusion: The conceptual framework to understand NNM can be well adapted from MNM for designing future studies. Future studies should also have a prospective study design; consider important points such as simpler neonatal morbidity scoring systems and include some additional management variables and congenital malformations. Consensus on definition and simple, feasible and meaningful criteria for identification of NNM cases is the need of the hour. Neonatal, Near miss, Criteria, Quality of care. Neonatal health is one of the unaccomplished targets of the Millennium Development Goals for women’s and children’s health. About two-thirds of infant deaths and half of under-five child deaths occur during the neonatal period . The neonatal period represents the most vulnerable time for a child’s survival. As per global estimates for 2015, 2.7 million deaths, or roughly 45% of all under-five deaths, occur during this period. Of these, almost one million neonatal deaths occur on the day of birth, and nearly two million die in the first week of life. The proportion of child deaths which occur in the neonatal period has increased in all World Health Organization (WHO) regions over the last 25 years. This may become a major hurdle in achievement of Sustainable development goal target 3.2 (SDG-3.2) which aims to reduce neonatal mortality to at least as low as 12 per 1000 live births in all countries by 2030 . Neonatal deaths constitute only the tip of the iceberg of neonatal morbidity. The morbidity rate remains elevated despite a decrease in the neonatal mortality rate, particularly in wealthy, but also in low and middle-income countries like India. It is therefore essential to understand the extent of all this morbidity and factors which prevented it from turning it into mortality. Hence examining and studying the system for identifying those neonates, who escaped from being captured as death is very crucial to reduce the deaths in future. These neonates who survive despite of complications may be referred to as ‘Near miss’ cases. This Near miss concept and the criteria based on clinical audit have been proposed as useful approaches for obtaining useful information on maternal and newborn health. This concept is increasingly used as a tool to improve quality of care for maternal health. Maternal near miss is defined by the WHO as ‘a woman who nearly died, but survived a complication during pregnancy, childbirth or within 42 days of termination of pregnancy’. Several studies on near miss obstetric events have been conducted globally and in India [3-12]. A prospective observational study conducted in two tertiary hospitals of Mumbai on maternal near-miss events have laid down recommendations at personal, community and family level to improve maternal care . It has been hypothesized that on similar lines neonatal near-miss concept should be developed to improve neonatal health. Near miss concept in Pediatrics or Neonatology has been otherwise used in context of severe conditions like severe cases of neonatal jaundice, encephalopathy or as near miss infant death syndrome from as early as 1970.Though till now there are no standard criteria or definition for neonatal near miss cases, as that of maternal near miss, it refers to situations where newborns nearly died between 0-28 days and they survived by chance or because of good quality of care . It would also refer to ‘an infant who nearly died but survived a severe complication that occurred during pregnancy, birth or within seven days of extra-uterine life [15,16]. Some authors have defined it as a neonate that presents with a severe life-threatening complication during the neonatal period but survives [17,18]. Most of the times roots of early neonatal deaths lie in deficiencies of primary obstetric care and early neonatal care. It is crucial to identify deficiencies in services rendered to neonates and pregnant women and to improve quality of care in particular during pregnancy and childbirth. Primary maternal causes like spontaneous preterm birth, intrapartum birth, asphyxia, birth trauma, infections, hypertension, antepartum hemorrhage, preexisting maternal disease are known to have adverse neonatal outcomes which can however be prevented if due precautions are taken. As number of survivors of critical events will be more than neonatal deaths, larger number of cases can be studied to understand health system failure as compared to neonatal death studies to identify gaps in quality of care during pregnancy, which can be rectified. There is scarcity of data on neonatal near misses so far, especially in India and other low and middle income countries. Very few reviews on neonatal near miss have been done so far. Considering its usefulness as a tool to improve neonatal care, this review was undertaken with the objective of conceptualizing Neonatal Near Miss event based on the experience on Maternal Near Miss; to review the Neonatal Near Miss studies conducted so far and to understand the similarities, differences and gaps in these studies which will provide suggestions for conduction of future studies. The above mentioned prospective observational study reported 4.6% of near miss obstetric events (n=877) among total obstetric admissions (n=19176). 94 maternal deaths were reported and Near miss to mortality ratio was 9.4:1 in the study. If maternal deaths are to be further reduced, factors contributing to life threatening severe obstetric events need to be addressed as shown in the above figure. As these events simulate maternal deaths, these factors need to be addressed for reducing such events and indirectly maternal deaths. However more important are the positive factors which pulled out the women and saved their lives. These factors bring out the positive elements in the health care system. The factors which pushed the women and lead to death are also shown in the above figure and these factors need to be addressed for reducing maternal mortality further. 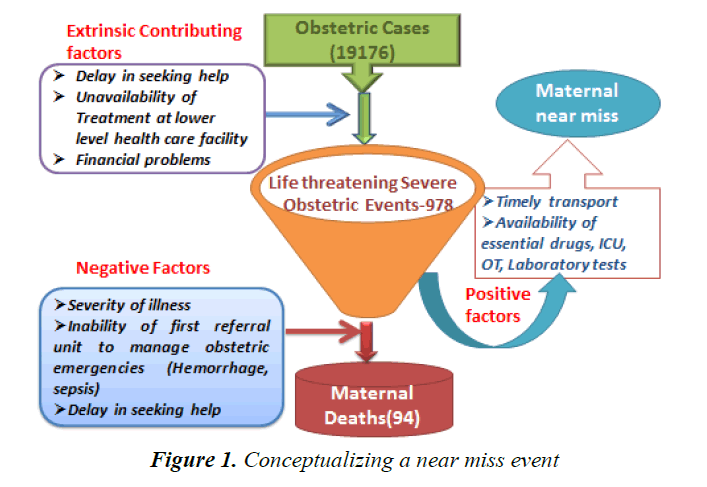 On the basis of this conceptualization of near miss obstetric events in the previous study by authors, neonatal near miss event can be conceptualized to understand various positive and negative factors associated. In virtue of above findings, following points may be considered while conceptualizing a Neonatal Near miss event (Figure 2). A neonatal near miss event needs to be conceptualized systematically considering all the intrinsic (mainly related to neonate) and extrinsic (system related, delay in referral) factors. The negative factors which push the baby towards mortality should be compared with the positive factors which actually pulled out the baby from turning into mortality (Figure 1). Review of these factors has the potential to highlight the deficiencies as well as the positive elements in the provision of maternal and neonatal services in any health system. Valid and reliable tools are required to routinely assess quality of care and provide improvements accordingly. Hence it is essential to study these factors with respect to neonatal near miss cases which will help to correct gaps in quality of care related to pregnancy. However, use of this near miss concept has not been largely explored as a tool to assess quality of care for newborns. For writing this article, the problem of severe acute neonatal morbidities was conceptualized by exploring its linkages with critical interventions, neonatal deaths and neonatal survivals. Literature search from 1998 till date with keywords focusing on relevant topics such as neonatal near miss, quality of care, neonatal deaths was carried out through computerized databases-Medline, Embase, PubMed, Cochrane and Google. The personal knowledge of authors and experience in the field has helped in identifying the articles and databases not revealed by computer searches. References of various manuscripts were searched to identify the missing information. State and Central Health Ministry websites were searched for relevant service records (Health management Information System, -HMIS). About forty references were reviewed and published studies pertaining to severe acute neonatal morbidities and neonatal near miss were included. The authors have added reference pertaining to one of their study on maternal near miss conducted in Mumbai. Figure 1. Conceptualizing a near miss event. The review includes detailed review of each of the studies and concurrent evolution of neonatal near miss in concept, criteria and parameters. Comparison of different studies discussed in this review is shown in Table 1. A study conducted by Pileggi et al. [15, 18] and Souza et al. comprised of secondary analysis of the Brazilian dataset of the 2005 World Health Organization (WHO) Global Survey on Maternal and Perinatal Health. It mainly evaluated maternal and perinatal outcomes in relation to mode of delivery in randomly selected health facilities. Out of the 15,169 live born infants included in this analysis, at least one of the following conditions was present among 424 neonates: very low birth weight, less than 30 gestational weeks at birth or an Apgar score at the 5th min of life less than seven. The results showed early neonatal mortality rate of 8.2/1,000 live births, the neonatal near miss rate 21.4/1,000 live births . Further pioneering initiatives were taken in this aspect by Pileggi et al. . This study is of paramount significance as it evolved specific criteria for identification of neonatal near miss cases by performing the database analysis of two World Health Organization cross-sectional studies. The first one was the Global Survey on Maternal and Perinatal Health [WHOGS (2004–2008)] in which 373 health facilities in 24 countries were included and the second was the Multi-country Survey on Maternal and Newborn Health [WHOMCS-(2010–2011)] which involved 359 health facilities in 29 countries. The analysis was done in two steps: Initially the development of pragmatic markers of severe neonatal morbidity was carried out using the WHOGS data set which was then validated with the WHOMCS data set. The diagnostic accuracy of management markers of severity was determined using WHOMCS dataset. Consequently the previously developed pragmatic markers were combined with management markers to develop a full set of criteria. Following criteria was proposed on basis of the analysis. Cynthia et al. Brazilian dataset (WHO) Global Survey 15169 21.4 8.2 Very low birth weight, less than 30 gestational weeks at birth or an Apgar score at the 5th min of life less than 7. Manandhar et al. Nepal, District Health Facility staff NA* 28 cases NA* Bag and mask Ventilation, BW<1.5 kg, PSBI (47%) birth asphyxia (43%). Bushtyrev et al. Russia 16588 85.5 2.7 Pragmatic markers by Pillegi et al. This study paved a way for other researchers in this area who undertook further studies on the basis of this study. Silva et al. conducted a study in which 24,061 live births were included from the “Birth in Brazil” survey database between February 2011 and July 2012. Variables used for identifying neonatal near miss cases were Apgar score<7 at 5 min of life, gestational age (≤ 32, 33 to 36 and ≥ 37 weeks), birth weight (<1500, 1500 to 2499 and ≥ 2500 g), multiple births. Management variables identified were: need of mechanical ventilation, supplemental oxygen after birth, neonatal intensive care admission, nasal CPAP, tracheal intubation in the delivery room, cardiac massage, resuscitation drugs, need of phototherapy in the initial 72 h of life, surfactant administration, using antibiotics in the initial 48 h of life. Some other variables like presence of congenital malformation, seizures, respiratory diseases of the newborn (such as transient tachypnea of newborn, hyaline membrane disease, meconium aspiration syndrome); hypoglycemia and necrotizing enterocolitis were also considered. Neonatal mortality rate was 11.1/1000 LB and neonatal near miss rate was 39.2/1000 LB. After testing nineteen variables, five variables (birth weight of less than 1,500 g, Apgar score of less than seven at 5 minutes of life, use of mechanical ventilation, gestational age of less than 32 weeks and congenital malformations) were identified as neonatal near miss indicators . A prospective study on Neonatal Near Miss Cases was conducted in Nepal between October 2010 to April 2013 at different health facilities by Manandhar et al. At first Health facility staff was trained on identifying neonatal near miss cases on basis of the criteria proposed. Neonate was referred to near miss if he/she received bag and mask ventilation or was managed for Very Low Birth Weight (birth weight<1.5 kg) or treated and/or referred for Possible Severe Bacterial Infection on (PSBI). 28 cases of neonatal near miss were reported from different health facilities. A matched case control study was performed among pregnant women and their newborns between 2009 and 2013 by Muwanguzi et al. He analyzed risk factors of neonatal near miss at a peri-urban hospital in Uganda. Out of 224 newborns, 56 cases were classified as near miss and 168 controls were classified as perinatal deaths. Delivery at night, low Apgar score at one and five minutes and grade III suboptimal care were found to be associated with perinatal deaths [19,20]. A prospective cohort study was conducted by Nakimuli et al. between March 1, 2013 and February 28, 2014 in Uganda’s national referral hospital, in which neonatal outcomes from cases of severe pregnancy and childbirth complications were studied. The obstetric conditions included obstetric hemorrhage, hypertensive disorders, obstructed labor, chorioamnionitis and pregnancy-specific complications such as malaria, anemia and premature rupture of membranes. Neonatal near miss cases were defined using criteria that employed clinical features, presence of organ-system dysfunction and management provided to the newborns. Though he used both pragmatic management markers developed by Pileggi et al. , the cut off in Pragmatic markers was modified as he included gestational age less than 30 weeks and birth weight less than1500 g. Additional management variables used were neonatal respiratory morbidities; hypoglycemia and necrotizing enterocolitis. The statistically significant attributable risk of newborn deaths (still birth or neonatal deaths) was associated with antepartum hemorrhage, ruptured uterus, severe preeclampsia, eclampsia, and HELLP syndrome (Hemolysis, elevated liver Enzymes, Low Platelets) . A study report of neonatal near miss cases in Rostovondon city in Russia by Bushtyreva et al. from January 2011 to January 2015 shows 85.5 % of neonatal near miss cases per 1000 live births in 16588 liveborns.However only Pragmatic markers developed by Pillegicastro were used (Table 1) . Very few reviews have been published so far. A narrative review by Avenant has emphasized on the need to develop and validate an easy-to-use simple definition of the neonatal near miss in order to help improve the obstetric care . He also took into consideration certain neonatal morbidity scoring systems for this purpose. However none of the neonatal morbidity scoring systems is applicable or appropriate for this purpose. It was suggested that an organ system dysfunction/failure approach similar to that used in the classification of Severe Acute Maternal Morbidity may also be used in case of severe acute neonatal morbidity and neonatal near miss. It is an objective method, which can be of use in a variety of settings to identify health system problems and to institute remedial action where necessary. Recent systematic review published by Santos in 2015 have also recommended detailed prospective evaluation, in locations with more substantial resources, the combination of the 3 criteria with management criteria for severity (indicating dysfunction or failure of organs and systems) for the identification of neonatal near miss cases . These recommendations were on basis of four studies which have also been discussed above. The need of standardization of neonatal near miss concept and criteria for considering its applicability at different levels was also emphasized. ‘The PAHO’ (Pan American Health Organization) have formed a neonatal near miss working Group(countries from Latin America) and had recently supported a meeting of experts in this regard with the common purpose of reaching a uniform definition, proposing standard criteria of neonatal near miss. It was recommended comprehensive and prospective studies should be planned for validation of the concept and criteria of neonatal near miss . A maternal near miss model which includes clinical, laboratory criteria and organ dysfunction may be adapted along with Pillegi’s criteria for reaching consensus on Neonatal near miss criteria. The review indicates that studies on neonatal near miss have been conducted globally and in some African countries. However, hardly any studies have been conducted in South East Asian countries where such studies would be very useful. The studies done so far have taken a lead on basis of the fundamental work by Pileggi et al. . The pragmatic and management markers defined on basis of the retrospective analysis of two large WHO a data base is of utmost importance. These markers were used in further studies to classify Neonatal near miss cases. However application of these markers was not uniform in all the studies as some studies considered only Pragmatic markers, some considered both and few studies defined their own set of markers for classifying neonatal near miss cases. Hence, there is discrepancy in the neonatal near miss rates derived from various studies done so far. It is seen that inclusion of only pragmatic variables has yielded higher number of near miss cases. In some cases, in spite of using both management and pragmatic markers, certain aspects of management were uncovered. Most of the work is retrospective and some studies have evaluated neonatal near miss cases only in specific conditions like obstetric complications and specific settings like health facilities at lower level. Therefore, all the maternal and newborn factors modifying neonatal outcome have not been considered altogether so far as variables developed are retrospective estimates of data. The prospective evaluation was done in very few studies but in those all maternal and neonatal factors were not studied. Figure 2. Conceptualizing a neonatal near miss event. The review of the above mentioned studies indicates that quantitative improvement in services has been achieved in various countries, however the quality needs scrutiny and direct adaptation of Criteria developed on basis of WHO data base in all the settings would be inappropriate as some neonatal near miss cases are likely to be missed. Certain parameters such as birth weight<1.750 g, gestational age<33 weeks may not hold true at all the settings especially in some developing countries like India where in survival rate in neonates at 33 weeks or weight 1.750 kg is reasonably higher without any complications. Hence these pragmatic markers may vary in different settings. It is also not wise to use only pragmatic marker as a variable for neonatal near miss as it will give an overestimation of neonatal near miss cases which will be inaccurate and as all lifesaving interventions will not be captured and it may miss certain number of neonatal near miss cases. We should have specific criteria pertaining to specific patterns of neonatal near miss events which would facilitate use of neonatal near miss of quality assessment and improvement tool assessment. As it largely depends on intensive care monitoring and treatment facilities at health facility, uniformity in development of criteria is a challenge. Thus the work done in this area needs further extension and standardization on similar lines as that of maternal near miss for evolvement of simple, feasible criteria but crisp and stringent too, which will be applicable to a variety of settings regardless of the development level. Paradigm variables developed in WHO studies may be modified further if all factors are considered in future. Following points may be considered for designing future studies. Analogous to evaluation of maternal near miss on basis of severe acute maternal morbidity, neonatal near miss should also be evaluated on basis of severe acute neonatal morbidity for which certain aspects of various neonatal morbidity scoring systems predicting neonatal outcome may be considered. Important scoring systems are National Therapeutic Intervention Scoring System (NTISS), CRIB I and II (Critical Risk Index of Babies), SNAPPE I and II (Score for Neonatal Acute Physiology) [17,25-27]. Amongst these, CRIB and SNAP are mainly used to evaluate neonatal care quality and prediction of mortality. CRIB was created for gestational age less than 32 weeks at birth [28,29]. Whereas SNAP may be used at any gestational age though it has been developed from a cohort of few newborn infants weighing less than 1500 g. These morbidity Scores are usually calculated during the first 24 h of life on basis of factors including each organ system dysfunction and altered laboratory parameters like base excess, PO2/FiO2 ratio. Due to their complexity and requirement of laboratory-based information, majority of existing scoring systems cannot be routinely applied at all levels of health facilities. Furthermore, these systems are limited to certain newborn and infant groups . Severe acute neonatal morbidity has also been defined on basis of organ dysfunction by Mukwevo. It included treating abnormalities in any organ system or supporting these systems within three days of delivery . The other organ system dysfunction scores like PELOD (Pediatric Logistic organ dysfunction score and NeoMOD (Neonatal multiorgan dysfunction score also exist. Though, these scoring systems were developed for a variety of uses and are relatively complex and inconvenient to use, some parameters like markers for respiratory dysfunction, cardiac dysfunction, hematological dysfunction may be utilized for defining organ system dysfunction criteria for neonatal near miss especially in prospective study designs [31,32]. All the congenital malformations may not be included in the criteria as some congenital malformations are not life threatening and do not contribute to neonatal outcome and in many instances death cases may not have been preventable even with effective interventions. Therefore a criterion for inclusion of congenital malformation has to be stringent. Similarly, poor neonatal outcome is associated with extremely premature babies; hence its correlation with neonatal near miss cases should be carefully looked in to. It may help to explore pattern of near miss cases pertaining at various levels of health care facilities (Personal, family/ health facility level). Concisely, there is a need of consensus on definition and criteria for identification of neonatal near miss cases. 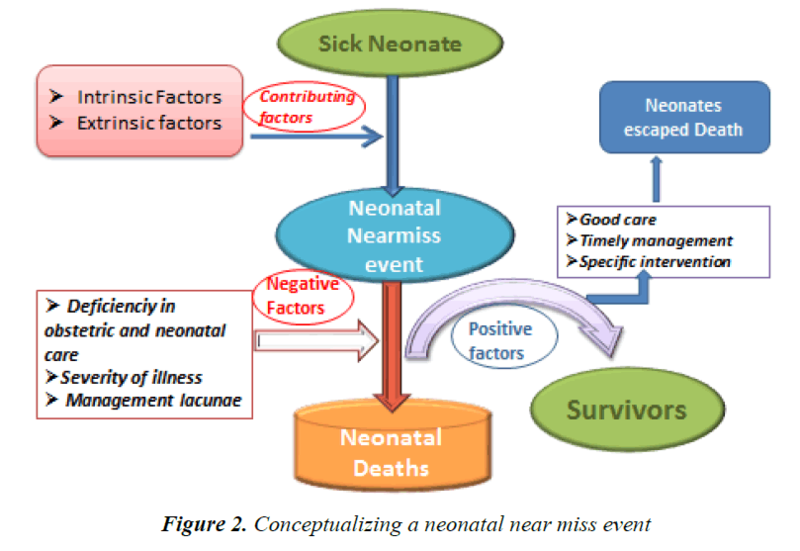 Since severe neonatal morbidity encompasses a huge group of conditions responsible for mortality whereas babies with neonatal near miss events have certain factors which saved them from turning in to mortality, this bottleneck between neonatal near miss and severe acute neonatal morbidity needs to be differentiated and explored so as to enable accurate prediction of specific morbidity and mortality. So our review suggests that future studies should be undertaken taking into consideration all the aspects pertaining to severe neonatal morbidity and neonatal mortality as discussed. The conceptual framework will help us to understand the chain of events from sick neonate to neonatal near miss event and further to neonatal deaths and also the factors contributing for the same. It will help to strengthen the health care system. Annual audit of these events will identify prevalence of life threatening conditions at birth and during neonatal period and thereby help to develop annual strategy for neonatal management in each setting. Lastly, this may help to evolve into simple, feasible and meaningful criteria for identification of neonatal near miss which may serve as a tool for improving quality of neonatal care at each setting regardless of the local level. The authors acknowledge the encouragement received from ICMR (NIRRH/IR/449/01-2017). Every newborn: An action plan to end preventable deaths. World Health Organization 2014. Mantel GD, Buchmann E, Rees H, et al. Severe acute maternal morbidity: a pilot study of a definition of near miss. Br J Obstet Gynecol 1998; 985-990. Sivalingam N, Looi KW. Clinical experience with management of ?near miss? cases in obstetrics. Med J Malays 1999; 54: 496-503. Ceccati J, Souza J, Parpinelli M, et al. Research on severe maternal morbidities and near-misses in Brazil: What we have learned. Reprod Health Matters. 2007; 15: 125-133. Adisasmita A, Deviany PE, Nandiaty F, et al. Obstetric near miss and deaths in public and private hospitals in Indonesia. BMC Pregnancy Childbirth 2008; 12: 10. Souza JP, Ceccati JG, Parpinelli MA, et al. Appropriate criteria for identification of near miss maternal morbidity in tertiary care facilities: A cross sectional study. BMC Pregnancy Childbirth 2007; 7: 20. Taly A, Gupta S, Jain N. Maternal intensive care and ?near?miss? mortality in obstetrics, J Obstet Gynecol Ind 2004; 54: 478-482. Khosla AH, Dahiya K, Gangwan K. Maternal mortality and near miss in rural north India. Int J Gynecol Obstet 2000; 68: 163-164. Chhabra P, Guleria K, Saini NK, et al. Pattern of severe maternal morbidity in a tertiary hospital of Delhi, India: A pilot study. Top Doct 2008; 4: 201-204. Purandare C, Bhardwaj A, Malhotra M, et al. Maternal near-miss reviews: Lessons from a pilot programme in India. BJOG 2014; 121: 105?111. Kulkarni R, Chauhan S, Daver R, et al. Prospective observational study of near-miss obstetric events at two tertiary hospitals in Mumbai, Maharashtra, India. Int J Gynaecol Obstet 2016; 132: 170-173. Say L. Neonatal near miss: A potentially useful approach to assess quality of newborn care. J Pediatr 2010; 86: 1-2. Pileggi C, Souza JP, Cecatti JG, et al. Neonatal near miss approach 2005 WHO global survey, Brazil. J Pediatr. 2010; 86: 21-26. Avenant T. Neonatal near miss: A measure of the quality of obstetric care. Best Pract Res Clin Obstet Gynaecol 2009; 23: 369-374. Silva AA, Leite AJ, Lamy ZC, et al. Neonatal near miss in the birth in Brazil survey. Cad Saude Publica 2014; 30: S1-10. Pileggi C, Camelo JS, Perdona GC, et al. On behalf of the WHO multicountry survey on maternal and newborn health research network. Development of criteria for identifying neonatal near-miss cases: Analysis of two WHO multicountry cross-sectional studies. BJOG 2014; 121: 110-118. Manandhar S, Manandhar DSM, AdhikariD, et al. Neonatal near miss cases of different health facilities. J Nepal Paediatr Soc 2014; 34: 115-118. Mukwevo MTP, Avenant T, Pattinson RC. Developing a practical clinical definition of severe acute neonatal morbidity to evaluate obstetric care: A pilot study. Presentation at the 27th Conference on Priorities in Perinatal Care in Southern Africa. Hartenbos 2007. Nakimuli A, Mbalinda SN , Nabirye RC, et al. Still births, neonatal deaths and neonatal near miss cases attributable to severe obstetric complications: A prospective cohort study in two referral hospitals in Uganda. BMC Pediatrics 2015; 15: 44. Bushtyrev VA, Bushtyreva IO, Kuznetsova NB, et al. Audit of neonatal near miss: Possibilities of improving in perinatology polymorphisms. Scientific and Practical Journal of Obstetrics and Gynaecology, Russian Federation. 2016. 7. Santos JP, Cynthia PC, Camelo JS, et al. Neonatal near miss: A systematic review. BMC Pregnancy Childbirth 2015; 15: 320. Santos JP, Cecatti JG, Serruya SJ, et al. Neonatal near miss: The need for a standard definition and appropriate criteria and the rationale for a prospective surveillance system. Clinics 2015; 70: 820-826. Gray JE, Richardson DK, McCormick MC, et al. Neonatal therapeutic intervention scoring system; a therapy-based severity of illness index. Pediatrics 1992; 90: 561-567. Parry G, Tucker J, Mordi TW. CRIB II an update of the clinical risk index for babies score. Lancet 2003; 361: 1789-1791. Richardson DK, Corcoran JD, Escobar GJ, et al. SNAP-II and SNAPPE II: Simplified newborn illness severity and mortality risk scores. J Pediatr 2001; 138: 92?100. Prry G, Tucker J, Mordi TW. UK neonatal staffing study collaborative group. CRIB II: An update of the clinical risk index for babies score. Lancet. 2003; 361: 1789-1791. Dorling JS, Field DJ. Value and validity of neonatal disease severity scoring systems. Arch Dis Child Fetal Neonatal Ed 2008; 93: F80-F82. Aufieri R. Multiple organ failure in the newborn. Journal of Pediatric and Neonatal Individualized Medicine 2014; 3: e030254. Bonnaerens A, Thaens A, Mesens T, et al. Identification of neonatal near miss by systematic screening fo metabolic acidosis at birth. In Obgyn 2011; 3: 281-285.